making healthy exercise fun! Help them burn out extra energy. size Hippity Hop Ball for yourself! WALIKI's HOPPER BALL (also known as Bouncy Ball with handles, Kangaroo Bouncer, Hopping Ball, Hoppity Hop, Sit & Bounce, Jumping Ball) Give your children a Hop Ball and watch them go! 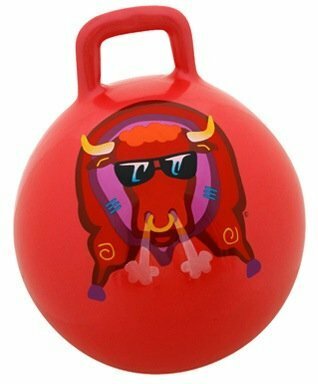 Thicker and more durable thanother generic brands on amazon, our Hopper Balls are a fabulously fun way forkids to exercise without even knowing it. We guarantee children will burn offtheir extra energy and parents will enjoy watching the action. Double-actionpump not included. Go all the way Try an adult size Hippity Hop & bounce with your child. Why? We think adultsdeserve to have fun too! And because we can. Not a time travel machine. Birthday parties If you think one child bouncing is fun, imagine an entire birthday partybouncing together, and each child taking a ball home as a party favor. That'sexciting! Not just for fun WALIKI's extensive toy line is used in kindergartens and schools to stimulatecreativity, movement and exercise. Therapists enlist our Hopping Balls as a therapy ball for kids, a toy forautistic children and a fine-motor improvement tool ADHD toy. So much Fun Professionals have many uses for the Hop Ball but we make it with FUN in mind,kids all over the world love them! There is a video of people jumping in over40 countries. Safety Waliki's bouncy toys are designed with love in Miami, Florida, and made withcare in PRC. The plug is a small part so children under 3 should have adultsupervision. They conform to ASTM-963 toy safety standard. Keep the kids happy and entertained with Waliki's colorful and cool JumpingBalls! Waliki Toys, based in Florida, was inspired by a wonderful grandmother. Ourgoal is to keep children happy, busy and healthy by making exercise fun. Weproduce a huge range of ride on bouncy toys, bounce houses, and are proudresellers of Rody Horse, which is made by Gymnic. 2016 Origins Set Booster Box - Mtg Magic The Gathering Tcg Card Game - 36 Pac.. Early Reading Program For Baby Toddler Preschool Kindergarten- Alphabet Vowel..
Sprogs Spg-Ena1020-So Felt Storyboards Set With Storage Bag Construction Fire..
Wham-O Slip N Slide Wave Rider Double With 2 Slide Boogies(Discontinued By Ma..
Zuru Bunch O Balloons Fill In 60 Seconds 350 Water Balloons 20" Water Balloon..
Disney Advanced Talking Buzz Lightyear Action Figure 12'' (Official Disney P..
Bouncepro 14; Trampoline With Proflex Enclosure And Electron Shooter Game Dar..
Blomiky 506Hg Wifi Fpv 12.0Mp Full-Hd 1080P Rc Quadcopter Drone With Camera L..
Ihousekeeper Speed Cube 3X3 3X3X3 Speedcubing Carbon Fiber Sticker Smooth Mag..
Water Balloons High Quality Gamewood 222 Total Water Balloons 6 Different Col..